Developing countries are the ones with high economical potential and provide high income opportunities to the investors. Beside the fact that these countries have a high growth rates they also include high risks. In order to prevent risks some protection measures could be taken. In this perspective, gold is commonly accepted as a safe haven. Aim of this study is to show whether gold is safe for investors in the risky markets. For this purpose interactions between developing market indexes and the gold market have been analyzed. In the study, Turkey, China, Brazil, Russia and India are selected and market index data of these are examined. In addition international gold price series are included into the data set for an indicator of gold market. This study covers the period of 01.01.2010-01.10.2018 and DCC methodology which deals with time dependent correlations is implemented. According to the results the correlations between gold market and other markets are time varying and volatile. Gelişmekte olan ülkeler, ekonomik potansiyeli yüksek olup yatırımcılara yüksek getiri imkanları sunan ülkelerdir. Bu ülkeler çok hızlı büyümeleri dışında risk oranlarının da yüksek olduğu piyasalardır. Risklere karşı çeşitli korunma yöntemleri mevcuttur. Bu bağlamda altın güvenli bir hedge ürün olarak yaygın kabul görmektedir. Bu çalışmada, altının, riskli piyasalarda yatırımcılar için güvenli bir yatırım ürünü olup olmadığının gösterilmesi amaçlanmaktadır. Bu amaç doğrultusunda, altın piyasaları ile gelişmekte olan ülkeler arasındaki etkileşimler analiz edilmiştir. Çalışmada, gelişmekte olan ülkelerden Türkiye, Çin, Brezilya, Rusya, Hindistan seçilmiş ve bu ülkelere ait hisse senedi piyasa endeksleri ele alınmıştır. Ayrıca altın fiyatlarının bir göstergesi olarak uluslararası altın fiyatları veri setine dahil edilmiştir. Çalışma, 01.01.2010-01.10.2018 dönemini kapsamakta ve analizde yöntem olarak koşullu korelasyonların zamanla değişimini ele alan DCC metodu kullanılmıştır. Çalışmanın bulgularına göre, uluslararası altın piyasaları ile incelenen ülke piyasaları arasında ki korelasyonların zamana bağlı ve oldukça oynak olduğu tespit edilmiştir. Afsal, E.M. ve Haque, M.I.(2016). Market Interactions in Gold and Stock Markets: Evidences from Saudi Arabia. 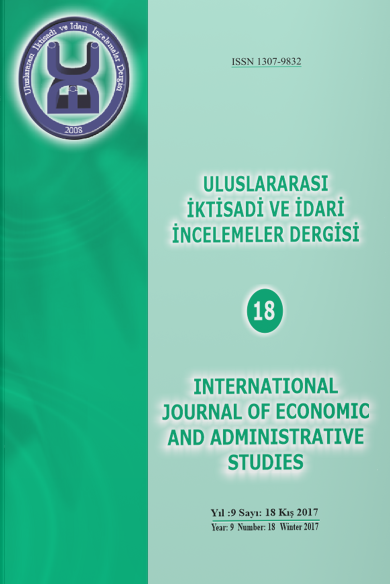 International Journal of Economics and Financial Issues, 6(3), 1025-1034. Baba, Y., Engle, R.F., Kraft, D.F., Kroner, K.F. (1991). Multivariate simultaneous generalised ARCH. Discussion paper 89-57, University of California, San Diego, Department of Economics. Baur, D.G. ve Mcdermott, T.K.(2010). Is gold a safe haven? International evidence. Journal of Banking & Finance, 34(8), 1886-1898. Bhatia, V. Das, S. Mitra, S.K.(2018). Crude Oil Hedging With Precıous Metals: A DCC-GARCH APPROACH. Academy of Accounting and Financial Studies Journal, 22(1). Bildirici, M. E., Alp, E. A., Ersin, Ö. Ö., Bozoklu, Ü. (2010). İktisatta Kullanılan Doğrusal Olmayan Zaman Serileri(1.Baskı). İstanbul: Türkmen Kitabevi. Bollerslev, T. (1990). Modeling the Coherence in Short-run Nominal Exchange Rates: A Multivariate Generalized ARCH Model. The Review of Economics and Statistics, 72(3), 498–505. Bollerslev, T., Engle, R., Wooldridge, J. (1988). A Capital Asset Pricing Model with Time-Varying Covariances. Journal of Political Economy, 96(1), 116-131. Capie, F., Mills, T. C., Wood, G. (2005). Gold as a hedge against the dollar. Journal of International Financial Markets, Institutions and Money, 15(4), 343-352. Engle, R. (1982). Autoregressive Conditional Heteroscedasticity with Estimates of the Variance of United Kingdom Inflation. Econometrica, 50(4), 987-1007. Engle, R.F. (2002). Dynamic Conditional Correlation: A Simple Class of Multivariate Generalized Autoregressive Conditional Heteroskedasticity Models. Journal of Business and Economic Statistics, 20, 339-350. Erdoğan, S. ve Bozkurt, H.(2009). Türkiye’de Cari Açığın Belirleyicileri: MGARCH Modelleri İle Bir İnceleme. Maliye ve Finans Yazıları, 1(84), 135-172. Gürgün, G. ve Ünalmış, İ.(2014). Is gold a safe haven against equity market investment in emerging and developing countries? Finance Research Letters, 11(4), 341-348. He, Z., O'Connor, F., Thijssen, J. (2018). Is gold a Sometime Safe Haven or an Always Hedge for equity investors? A Markov-Switching CAPM approach for US and UK stock indices. Internati-onal Review of Financial Analysis, 60, 30-37. Hepsağ, A. ve Akçalı, B.Y.(2016). Türk Finans Piyasasında İşlem Gören Bankalar İle ABD Finans Piyasası Arasındaki Volatilite Etkileşiminin Analizi. Avrasya Bilimler Akademisi, 1(1), 54-72. Jubinski, Daniel. ve Lipton, A.F.(2013). VIX, Gold, Silver, and Oil: How do Commodities React to Financial Market Volatility? Journal of Accounting and Finance, 13(1), 70-88. Junttila, J., Pesonen, J., Raatikainen, J. (2018). Commodity market based hedging against stock market risk in times of financial crisis: The case of crude oil and gold. Journal of International Financial Markets, Institutions and Money, 56, 255-280. Katzke, Niko. (2013). South Africa Sector Return Correlations: Using DCC and ADCCC Multivarite GARCH Techniques to Uncover the Underlying Dynamics. Stellenbosch Economic Working Papers 13-17. Kıraç, F. (2015). Küresel Krizin Bulaşma Etkisi: Menkul Kıymet Borsaları Üzerine Bir Uygulama. Kahramanmaraş. Kohn, M.B.H. ve Pereira, P.L.V.(2017). Speculative Bubbles and Contagion: Analysis of Volatility’s Clusters During The DotCom Bubble Based on The Dynamic Conditional Correlation Model. Cogent Economics and Financal Journal, 5(1). Lucey, B.M., Tully, E., Poti, V. (2006). International portfolio formation, skewness and the role of gold. Frontiers in Finance and Economics, 3, 1-17. McCown, J. R. and Zimmerman, J. R., (2006). Is Gold a Zero-Beta Asset? Analysis of the Investment Potential of Precious Metals. Preprin SSRN: <http://ssrn.com/abstract=920496>. Mohanty, S. K., Nandha, M., Turkistani, A. Q., Alaitani, M. Y. (2011). Oil price movements and stock market returns: Evidence from Gulf Cooperation Council (GCC) countries. Global Finance Journal, 22( 1), 42-55. Nandha, M. ve Brooks, R. (2009). Oil prices and transport sector returns: an international analysis. Review of Quantitative Finance and Accounting, 33(4), 393-409. Nandha, M. ve Faff, R. (2008), Does oil move equity prices? A global view. Energy Economics, 30(3), 986-997. Qadan, M. ve Yagil, J. (2012). Fear sentiments and gold price: testing causality in-mean and in-variance. Applied Economics Letters, 19(4), 363-366. Sherman, E. (1982). Gold: a conservative, prudent diversifier. Journal of Portfolio Management, Spring, 21-27. Tokmak, S. (2013). Altın Güvenli Liman Mı? Hisse Senetleri, DİBS, Döviz Kuru ve Altın Getirileri Arasındaki İlişkilerin Analizi. Çağ Üniversitesi Sosyal Bilimler Dergisi, 10(1), 21-36. Tse, Y.K. ve Tsui, A.K.C. (2002). A Multivariate GARCH Model with Time-Varying Correlations. Journal of Business and Economic Statistics, 20, 351–362. Yavuz, N. Ç. (2015). Finansal Ekonometri( 2.Baskı). İstanbul: Der Yayınları.